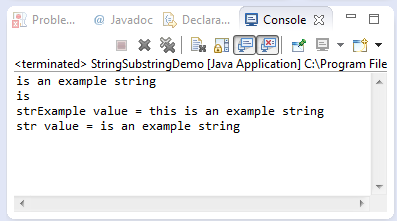 This java tutorial shows how to use the substring() method of java.lang.String class. This method returns a String datatype which corresponds to a portion of the original string starting from the begin index until the endIndex. If the endIndex is not specified, it is imperative that the endIndex is the String length. Note that since we are dealing with String, the index starts at 0. This method returns a String datatype which corresponds to the part of our string which we cut. If no endIndex is specified, then the end index is assumed to be String length -1. This example source code demonstrates the use of substring() method of String class. Basically this source code just prints the resultant string after using the substring method of String class. Always remember that the string would never change once it is instantiated thus the expression this.substring(index) would not change the value of String. If we want the value out of the substring method, we should assign it to a new variable.